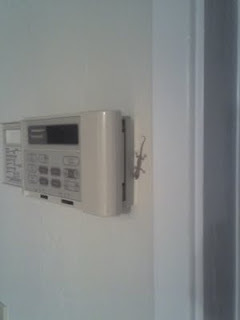 What you're seeing there next to the thermostat is a little gecko. These guys get into the house and you find them in random spots. They're almost always trying to get somewhere safe to hide, and they're never harmful. The dog will chase them, in fact she has a war with one spot outside the porch where they like to hide behind the mount for the Hurricane Shutters. 9pm and she's barking at a wall where nothing is hiding because she's barked at them the night before ... for months. Geckos will keep the insect population low and they'll die inside the house since we keep it sprayed to get rid of the insects. To see me use the Gecko Capturing Device which consists of an empty clear plastic storage jar from some candy and a sheet of 8.5x11 paper, running after the little things so I can set them free, with the Border Collie trying to climb me, and people in the house saying "Get him! Get him!"... well its a comical sight. And I'm always VERY careful never to harm them. They're way too useful, way too entertaining, and I always set them free in the yard to feed on the moths out there. Sorry, Pat, they do get inside but they eat mosquitos and really do look cute! Gecko's running around the house!!! Yes they are cute but not in the house-oh well I do live in New Jersey so I definitely don't have to worry about them! LOL And no I wouldn't harm them either-I would also take them back outside!